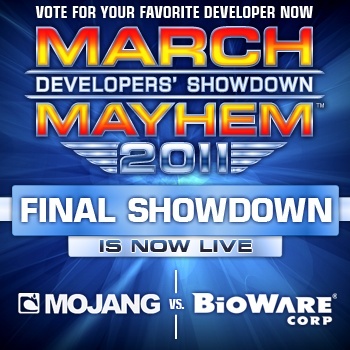 After 5 very difficult rounds in March Mayhem: Developers' Showdown, we are down to the final 2 developers - BioWare versus Mojang! The Final Showdown has begun and voting is now open. This is the fourth year The Escapist has run March Mayhem: Developers' Showdown and every year there have been a lot of great matches and huge upsets that have come down-to-the-wire. This year is no different as we have watched a developer voted into this year's March Mayhem as a wildcard make it to the Final Showdown, and last year's second place winner bulldoze its way through everyone to prove it has what it takes to win the title. Ladies and Gentlemen, your Final Showdown competitors - BioWare versus Mojang! BioWare is a veteran March Mayhem competitor having done extremely well in past years, making it to the finals the last two years and just coming up short in the final minutes of voting. This year however, BioWare has been nothing but spectacular as it took down TellTale Games, DICE, Bungie and then Bethesda to gain the Division Title. In the Fearsome Four it took on another number 1 seed, gaming powerhouse Blizzard, and continued to impress by bringing in more than 24,000 votes. It looks as though this may be BioWare's year to bring home the crown but first it has to get past its competitor. As a first time contestant in March Mayhem, Mojang was voted in by The Escapist Publisher's Club community as a wildcard to enter as a 16th seed and go up against a number 1 seed in the first round. Little did Mojang know, this first round competitor would be none other than the most well known developer in the world, Nintendo. Not discouraged in the least, Mojang fans from around the world came to The Escapist to back up Mojang and send Nintendo home early, the first time in March Mayhem history a number 1 seed has lost in the first round. Mojang continued its Cinderella story as it then defeated Namco Bandai, Epic Games and Obsidian Entertainment. The pressure increased as it met Escapist community favorite and last year's March Mayhem winner Valve in the Fearsome Four. After being down by over 1000 votes near the beginning, Minecraft fans came back to tie it after 24 hours of voting, then took the lead and kept it as they defeated Valve by over 3000 votes. This Cinderella story continues as Mojang faces its third number 1 seed for the title. As the Final Showdown opens its voting, it is anyone game. Who will take this year's crown? BioWare or Mojang? Only your votes and tweets will tell! Click here to begin voting and good luck to both developers! Welcome to the Final Showdown!